Kirby's Adventure is one of the most graphically-advanced games released for the NES, released near the end of the console's life cycle. It has a great amount of unused content, too – some of which would be recycled for future Kirby games. It was remade in 2002 for the Game Boy Advance as Kirby: Nightmare in Dream Land, followed by a 3DS port in 2011 as 3D Classics: Kirby's Adventure, using the original NES resources with minor differences like depth effects. Rooms used for testing purposes. Rooms that didn't make it in the final version of the game. Color palettes left by the wayside. Not so much the objects themselves, but the way they behave. According to the game's director, Masahiro Sakurai, several abilities, such as Rocket and Animal that were implemented in future Kirby games, were cut out of the final game, including one in which "Kirby could shrink down." These tiles of a tiny Kirby are found in sprite bank 8C, along with the graphics for the Mike and Ball abilities. The oddly-sized Kirby would have been used for a shrinking animation (Kirby does the raised hand pose for abilities like Crash and Light that aren't demonstrated right away). The Mini ability might have been replaced with the UFO power. All of the other ability tiles are close together in graphic banks 80-99, while the UFO Kirby graphics are located in bank C6. UFO is also the last normal ability by ID, further supporting this theory. Twelve years later, this ability would finally be implemented in Kirby and the Amazing Mirror...although in that game, you can't slide while using this power. Track 16 (10 hexadecimal in-game) in the Sound Test is an upscale version of the Kirby's Dream Land title screen theme. Meanwhile, Tracks 1, 4, 18 (12), 28 (1C), 31 (1F), 33 (21), 41 (29), 43 (2B), and 51 (33) are most of the level music without their intros, which were used in the later GBA remake. An untranslated duplicate of the invincibility icon, stored in bank 14. The icons normally used by the game are stored in banks 40-4B. Graphics for seven different water tiles of this style, stored in banks 24-27. Only two appear in-game. What they would have looked like animated. This icon is stored with the rest of the ability icons and does appear in-game, but is nearly impossible to see normally. Using the Mix ability, it can easily be seen during the roulette selection of abilities using an emulator's frame-by-frame advance feature. It was meant to be used when Kirby hopped into a cannon and, oddly enough, is used in the French version! This icon was also restored and used in the 3DS port. Banks 13 and 50 contain an unused dark room tileset! They are assigned to graphics set 22 and would have used palettes 8B-91, all of which are stored immediately after the ones used in-game (graphics set 21, palettes 84-8A). The level intro tileset seems to contain graphics for an early version of the level hub HUD. This is much darker than the HUD used in-game and the graphics are very different. A 7th stage door graphic. The largest level hub only has six stages in it, rendering this unused. Two of these three frames aren't shown in-game at all. The Poppy Bros. Sr. graphic is similar to his normal death frame, but his feet are on the ground. The Rolling Turtle graphic is strange – perhaps he could hide in his shell during battle? The frame for Mr. Frosty is actually used, but in a very obscure behavior that most players will not see: If he doesn't have enough room behind him to walk backwards to toss an ice cube (by carefully tricking him into stopping right before hitting a wall), it will fall on his head with this animation, and cause him to ram forwards into the wall. Apparently, the crane game was originally supposed to give you three credits, as evidenced by the presence of a "3" with the rest of the numeral graphics. Setting address $7BB to 03 as the game loads will give you three chances, as well as display this unused graphic, though it will still only count up to two Kirby plushes at the end of the game. At ROM address 0x7BAC9, the unused text string "~Star General ~" is found among the titles used for the file selection screen. The actual game goes from "~Swift Hunter ~" to "~ Star Herald ~" upon reaching 40% completion. At the end of the first room in Stage 2 of Vegetable Valley is the name "HAL" in the form of many Star Blocks; however, it is inaccessible due to the Warp Star beforehand that forces the camera to stop going to the right. 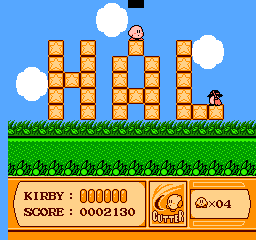 However, if you manage to overload the game's sprite memory (e.g., by throwing Cutters while several enemies are present) as the Warp Star scrolls into view, it will fail to load, allowing you to see the HAL blocks. This room can also be accessed by unloading the Warp Star by walking away from it to the point where it is off-screen repeatedly. Oddly, a Broom Hatter is present on the "L". There is also a door just off the top of the screen that leads to the next area, though it cannot be reached normally. 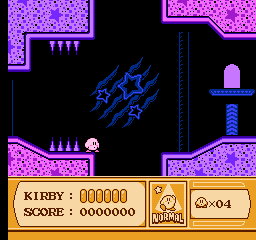 This is due to the way Warp Stars work; a regular exit representing the Warp Star's destination must be placed within the level, though these are typically not visible. Many HAL rooms, including this one, are also present in Kirby: Nightmare in Dream Land, but they are inaccessible without codes. Document any code differences in the other regional releases. 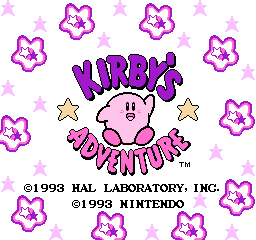 There are two major program revisions of Kirby's Adventure. The first of these was released in Japan, and was the basis for the original US revision 0. The second was released as US revision 1, and was the basis for all of the other localized releases (Canada, Europe, France, and Germany). The peculiar string RGKK_SetStillX can be found in US revision 0 at ROM address 0x7FFF0. This location seems to contain random data in every other version. 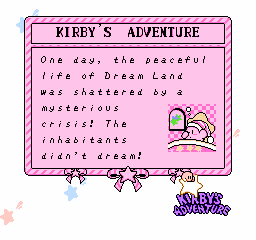 The spacing of the "KIRBY'S ADVENTURE" text is incorrect on the first few story pages in US revision 0. This was fixed in revision 1. The "Li'l Traueler" ranking in US revision 0 was corrected to "Li'l Traveler" in revision 1. 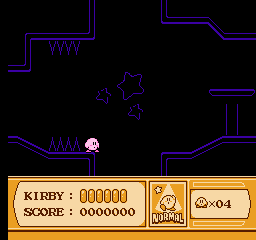 In the Japanese version and US revision 0, Kirby can trigger a Star Switch with the Mike ability if he is touching the very edge of the sprite's hitbox. If this is done when Kirby has one Mike left, the counter will underflow, which then causes the Mike to exhibit a variety of interesting graphical glitches (as seen here). This was fixed in revision 1 by preventing the Mike from interacting with the switch. The Japanese version is largely identical to the English one except for Japanese text, although all of the ability icons were originally rendered in English - including the "Burning" icon, which was changed to "Fireball" for unknown reasons. The Japanese version also lists Ice Cream Island as Icecream Island, and all instances of the Fountain of Dreams was the Fountain of Dream. 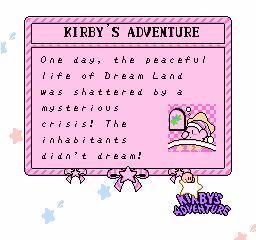 Nightmare in Dream Land retains the respective regional nomenclature used in the original game. For some reason, the intro of the Vegetable Valley theme was slightly altered in the European releases of the game. Confirm this? It's been a while. In the international releases of the game, the various stage themes each have two entries in the sound test: one with the intro, and one without. The latter variation is no longer present in the European releases. The French version appears to be based on the English release, but the level and ability names were changed from English to French. It also used the rare "Cannon" icon properly, although it is now "Canon". This page was last modified on 27 March 2019, at 12:16.